A project examining aspects of Roman military sites in Gwynedd was set up in 2000. The first three years of the project examined fort environs and succeeded in recovering much new information about vici and other extra-mural development. This has allowed better management of the sites and provided a greater appreciation of the extent of archaeological remains around the forts. 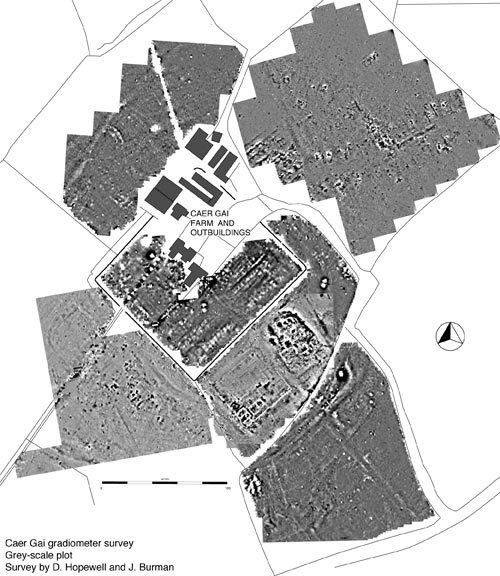 Following recommendations from Dr Jeffrey Davies, additional areas of geophysical survey will be carried out in the environs of Caer Gai and Cefn Caer, Pennal Roman forts during the 2005-6 phase of the project. The extent of the extra mural settlement was not fully established in the first year of the project due to time constraints and disruption caused by bad weather. In 2002 the project was expanded to examine the Roman military road network. This initially comprised the collation of the extensive and diverse corpus of available data and the mapping of the resulting road alignments as linear files in MapInfo (GIS programme). This includes linked database entries giving background information and assessments of confidence in the data. All lengths of road have now been assigned to one of four categories, discounted, projected, proposed and known. Information from RCAHMW consisting of a series of annotated maps produced during extensive fieldwork by the Ordnance Survey in the 1970s formed the basis for much of linear transcriptions. The MapInfo transcriptions allow the roads to be viewed alongside other Historic Environment Record information for planning and research purposes and provides a framework for further research and data enhancement. The 2002-03 phase of the project identified a number of areas where further work was needed, most notably a lack of accepted roads on Anglesey. It was also recognised that a comparative walk over study and condition survey of the extant lengths of road would be required before any scheduling recommendations could be made. The recent private publication of a book by Edmund Waddelove describing ‘200 miles of previously undiscovered Roman roads’ has also produced a large amount of new unverified data that needs to be assessed and transcribed into MapInfo. The less well researched routes required further documentary and field research before they could be added to the project GIS and database. Progress was made on these priority areas during the 2004-05 phase of the project. Examination of some of these routes was undertaken and study of aerial photographs following liaison with RCAHMW Aerial Survey & Photo Mapping department identified new and additional information. Fieldwork linked to proposed developments around the proposed line of the Roman road at Tremadog has been carried out but definite indications of an extant road remain elusive. Additional information about the road networks around Caer Gai and Tomen y Mur has also emerged. it is anticipated that the walk over study and condition survey will be completed during the 2005-06 phase. A report on the work to date has been accepted for publication in the next issue of Britannia.